As the Scottish government’s consultation on an independence referendum enters its final week, MPs have condemned the SNP’s proposed question as being “biased”. As the Scottish government’s consultation on an independence referendum enters its final week, the cross-party Scottish affairs select committee has condemned the SNP administration’s proposed question as being “biased”. As many picked up on, this question is may be “simple, straightforward and clear”, but it’s not quite as fair as Salmond suggests it is. By phrasing the question as “do you agree…” rather than the more neutral options of “do you agree or disagree…” or simply using “should”, there is likely to be a small but significant increase in the amount of people voting yes. Hern’s assertions have now been supported by Westminster’s Scottish affairs select committee in a report (pdf) looking at the referendum question published today. Based on the evidence we have received, we have no choice but to conclude that the question currently proposed by the Scottish government is biased in that it tends to lead the respondent towards the answer “yes”. The evidence supporting the committee’s assertion is twofold. Alongside this, to a separate sample, we asked a question with a subtle but important difference: “Do you agree or disagree that Scotland should be an independent country?” This time, 39% agreed, and 61% disagreed. Not a huge shift (indeed the change in both scores is within the margin of error) but if accurate this represents a four-point difference in the margin between union and independence. It is easy to see how two words – “or disagree” – could, in a close campaign, decide the fate of a nation. Would it be too cynical to suppose this is why Mr Salmond left them out? The second plank of evidence supporting the committee’s conclusion comes from a string of seasoned pollsters, all of whom agree the proposed wording is leading. The committee went on to argue the Electoral Commission should have overall responsibility for the conduct of the referendum and that no question should be put to the people until the commission was completely satisfied with it. “It is now beyond doubt that the question proposed by the Scottish government is biased. “A range of witnesses, with different backgrounds and from different sides of past referenda, were unanimous in the opinion that the question, as currently proposed by the Scottish government, is not fair. “We cannot have a contest in which separatists are both player and referee. That goes against every notion of fairness and transparency. “This exercise is devoid of credibility. “The Scottish government’s proposed referendum question is straightforward and fair – as acknowledged by Scottish Tory leader Ruth Davidson – and the ‘agree’ formulation was also used in Labour’s 1997 devolution referendum, and is the same wording used by the Tory/Lib Dem coalition for local referendums in England. 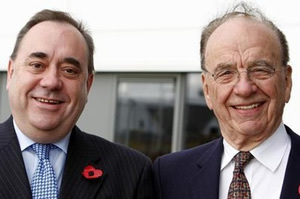 The report comes as the Sunday Herald reported over the weekend Alex Salmond will formally launch the “Yes to Independence” campaign on May 25th. Yes, I’m sure your desires for violence and bloodshed are nothing you’re ashamed of, given you so far to the right that you feel the need to try and inflict your sins onto others. I’m SO sorry I believe in gradualism, that I’m a mutualist, that your kind of intolerance is something I actively work against, and I believe in my country, *Britain*. The concept of a left winger rather than a centralist Labourite is simply inconceivable to you, I see. And I’m sure you’d be leading your kind’s campaign for “racial purity” in Scotland…I’ve seen your buddies plans, Ned. That you can’t even recognise a left wing separate from the (centralist) labour party is another typical symptom of your extremism. So sorry the Tories are not nearly far enough right for you, Ned. Because you are, by your own confession, a far right winger. Why would I be interested in discussion with someone whose own interest is smashing my face in? You’re a typical example of your violent kind, Ned. Liar! And what’s more, you’re a great example of NuLab blindness. If we assume you’re more than 12 and you’re old enough to vote, can we also assume that you can’t remember when Labour actually approached socialism with an open mind? Or perhaps you’re a Blairite who wouldn’t know socialism if it smacked him on the jaw? The fact is that I used to vote LAbour but stopped when they became indistinguishable from the Tories. You won’t shout me down with your lies. You are the perfect example of an agent provocateur – a fascist puporting to be a socialist. More idiocy! Do you ever have a look at what you’re writing before pressing “post”? Cite where I desired violence and bloodshed! You are NOT a left winger! You’re deluding yourself! Everything you write on here marks you out as a knee jerk Tory of the worst kind! And what’s more, when we go from “your country”, you’ll still have it, so what are you whining about? Jeez, what a right wing empire builder you are! I’m attacking you because you’re Jewish? That’s the first I’ve heard of this. Get help and get it now! Ah yes, social darwinist as well as a far right winger, I see. The typical assault on the mental health of anyone who dares disagree with the Party Line. You accuse me of your own sins, as usual. And that you accuse me, a committed left-winger and a Jew of being a Jew is right out the BNP dirty tricks handbook, which I’ve read a copy of. You called for a violent revolution. This is typical of your far-right wing aims. Moreover, terror-favouring separatists like you refuse to admit that breaking up the United Kingdom would end it, as usual… “we only want OUR independence” ignoring the wider effects. You accuse of being a right winger to cover up your own fanaticism. You. And I have copies of the posts, editing them now won’t help you.